Tonight was one of those nights. You know, the kind where you are making up dinner as you frantically roam the isles of the supermarket. Yeah, the ones when the family has a gazillion things going and you need something for dinner. The kind of night where you and your spouse contemplate a quick trip to the drive-thru, but you quickly realize that you've been there far too often lately. It was one of those nights, and here is what became of dinner. 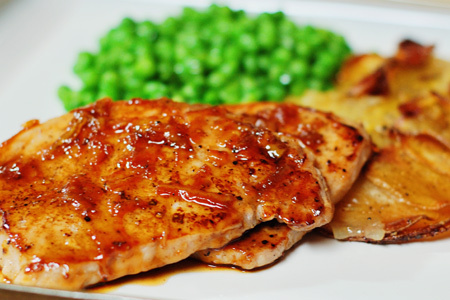 These are quick-n-easy center cut pork cutlets that are sauteed then glazed with some simple orange marmalade. 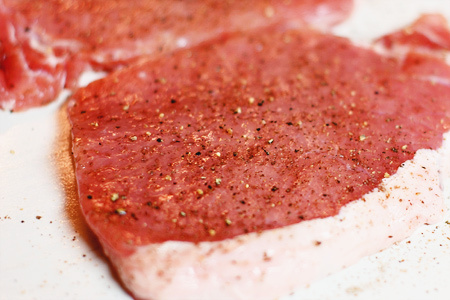 The only thing I did that was even mildly unusual was to season the cutlets with alderwood-smoked salt. I thought it would add an extra something to the flavor. Put two chops in a gallon zip-top bag and pound each lightly until they are just over 1/4" thick, then move to a platter or rimmed sheet pan. Repeat with the remaining chops. Season both sides of each breast with salt and pepper, cover and let sit at room temperature for about 20 minutes. When the oil just starts to smoke, add the cutlets. Cook them for 90 seconds. Flip the cutlets and immediately top each with a tablespoon of marmalade. Let them cook about 90 seconds more. Flip the cutlets again and cook for about 30 seconds. The marmalade will turn itself into a very nice glaze. 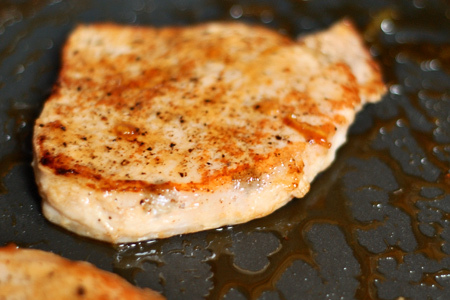 Serve each cutlet with a drizzle of the glaze that is remaining in the pan. I have made these before, but didn't pound them thinner first. Therefore my end result was a little tough and dry. Thanks so much for the tip. My family would love this served on a bed of rice. would you be able to grill these with the marmalade?